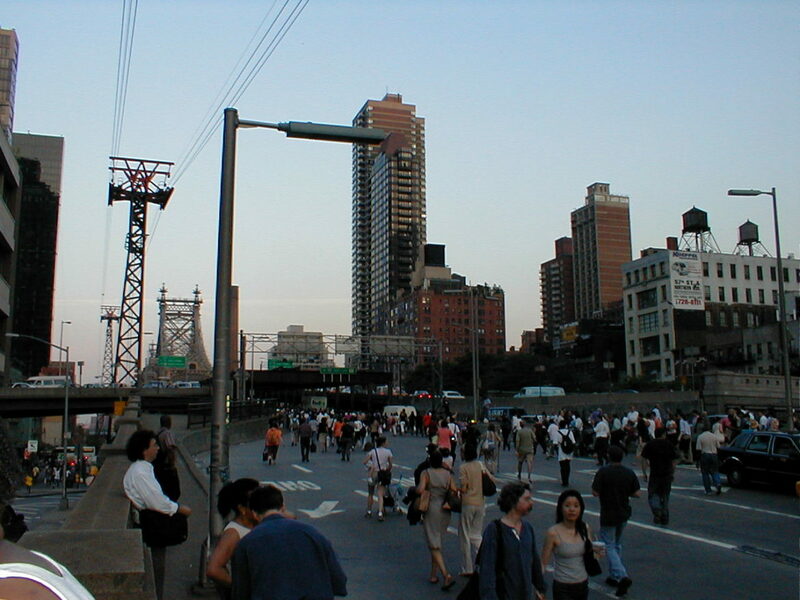 People walking across the Queensboro Bridge in New York City during the blackout of 2003. Experts later determined that a combination of human error and equipment failures had caused the blackout, the Scientific American reported. The blackout affected parts of the midwest, the Northeast and the Canadian province of Ontario and lasted from two days to upwards of a week in some areas. Sign up for InDepthNH.org’s free newsletters here. Power to the People is a column by D. Maurice Kreis, New Hampshire’s Consumer Advocate. Kreis and his staff of four represent the interests of residential utility customers before the NH Public Utilities Commission and elsewhere. It is co-published by Manchester Ink Link and InDepthNH.org. Let me say this as clearly and unequivocally as I can: The lights are not going out. There will not be rolling blackouts. There will not be rolling blackouts now, there will not be rolling blackouts this coming winter, and there will not be rolling blackouts in 2022, or in the winter of 2024-25. Eversource should stop claiming or implying otherwise. So should the CEO of regional grid operator ISO New England. “As the region runs closer to the edge of reliability, we are trending towards reaching a point where we will be ‘rationing electricity’ during winter conditions, according to @isonewengland CEO Gordon van Welie,” tweeted Eversource New Hampshire over the weekend. For the second time, van Welie has used an event at St. Anselm’s College, sponsored by the business lobbying group New England Roundtable, to issue misleading and alarmist warnings about dire consequences ahead. It is the precise equivalent of your passenger telling you that unless you turn the steering wheel so that your car follows the curve of the road you are driving, you will crash into a tree. In September of 2016 – with the question of forcing New Hampshire electric customers to pay for the controversial Access Northeast natural gas pipeline project still pending – van Welie took to the podium to pronounce the state of the New England electricity grid as “precarious.” Then Eversource and its partners put Access Northeast on hold (though its appeal of the decision by the Public Utilities Commission not to put the pipeline into electric rates is still pending). Since then, ISO New England has seemed to get smart. Rather than campaign unabashedly for more natural gas pipelines, so as to feed our ever-growing reliance on natural gas as the fuel of choice to produce electricity, the regional grid operator decided to conduct some analysis and issue a report based on the assumption that no new interstate pipeline projects are forthcoming. Of course that also means four of the scenarios would lead to no such trouble, even in the face of unusually cold weather of the sort we experienced most recently in January. We could focus on making those scenarios actually come about – the equivalent of steering the car correctly around the curve rather than aiming for the tree straight ahead. Or we could issue dire warnings about the tree. Actually, we’ve joined with others to try something different altogether. My office is part of a coalition – the other members are the Conservation Law Foundation, the Acadia Center, PowerOptions, RENEW Northeast and the Vermont Energy Investment Corporation (VEIC) – that sponsored additional research into fuel security by Synapse Energy Economics, Inc. The work was funded via a grant from the Barr Foundation in Boston. The Barr Foundation funds projects related to addressing climate change. That’s a focus of the other coalition members as well. What’s a ratepayer advocate doing among them? Energy policy driven by fear and unrealistic projections drives up the bills paid by utility customers. So, we share the concern of our coalition partners that the ISO New England fuel security study does not get the story right. Specifically, the Synapse research shows that ISO New England used unreasonable assumptions about how much demand for electricity and natural gas there would be during the extreme part of an extreme winter. And, for it’s so-called “reference case” – basically, what happens if we do nothing – the ISO did not give full effect to the renewable portfolio standards that have been adopted in all six New England states, the ISO did not take into account the effect of a Massachusetts law requiring 1,000 megawatts of additional renewable energy, and the ISO chose too low a value for how much liquefied natural gas we can count on. The bottom line: a more realistic business-as-usual scenario “shows few operational issues and no reliability threats” in the hypothetical extreme winter of 2024-25 that is the focus of the fuel security analysis. Translation: No rolling blackouts, no electricity rationing. In fairness to ISO New England, it has treated the fuel security study as a kind of opening bid. The ISO invited stakeholders to request analyses of alternative scenarios containing different assumptions about the development of renewables, liquefied natural gas arriving by boat, retirements of traditional resources typically described as “baseload” (e.g., the Seabrook nuclear power plant, the coal-burning Merrimack Station in Bow), reliance on energy efficiency, and the importation of electricity from Canada. The Synapse report is essentially a non-alarmist look at those scenarios. So, when I wrote “I call B.S.” above, the “BS” stood for “baseload subsidy.” The chief reason there will be no rolling blackouts is that ISO New England is legally responsible for so-called “resource adequacy” – a job that belonged to the individual states before industry restructuring. So, if the biggest electricity generator in New England happened to threaten to shut down in 2022 without a subsidy, ISO New England would seek permission from federal regulators to give it to them. Which is exactly what ISO New England has just done, in connection with Mystic Generating Station just north of Boston. With more than 1,700 megawatts of capacity, the natural gas-burning units 8 and 9 at Mystic Station are apparently too big to fail. But when their owner, the energy mega-conglomerate Exelon, announced it would shut down rather than participate in the region’s electric capacity auction for 2022, ISO New England decided it needed to act. “The retirement of Mystic 8 and 9 would pose an unacceptable fuel security risk to the region during the winter months,” wrote Eric Johnson, ISO New England’s director of external affairs, in a memo to the region’s regulators April 30. The next day, ISO New England formally asked FERC for permission to put these units on cost-of-service rates for at least two years. The filing clarifies that it’s not just the size of Mystic but the fact that units 8 and 9 rely on liquefied natural gas, which arrives by boat, rather than on fuel arriving via the interstate natural gas pipeline network. In the chilliest hours of ultra-cold winter days, most if not all of the interstate pipeline capacity is needed to heat homes and businesses. Generators that use gas from pipelines can find themselves without fuel during such hours because they do not purchase “firm” fuel commitments for economic reasons. Remember that cold snap in the first days of 2018? Most of New England’s natural gas generators were offline – but not Mystic 8 and 9. In other words, this is an example of deregulatory market failure. So the ISO wants to turn back the clock, as to Mystic, and essentially provide Exelon with the sort of guaranteed revenue stream we used to provide vertically integrated electric utilities throughout the country. But that assumes the reliability determinations in the fuel security analysis are right. To the extent they are, the FERC will approve subsidies, ratepayers will pay them, and the ongoing debates will continue about what new layers of Rube Goldberg mechanisms we need as we continue to try to reconcile free market principles with competing public policy imperatives related to energy. But the lights are not going out and there will not be rolling blackouts. Claiming otherwise is simply an inducement to the kind of panic that never makes for good policymaking.